Ramji Das said, "The date for construction of the Ram temple will be declared in the 2019 Kumbh which will be held in Prayagraj." Amidst growing demand for construction of the Ram temple in Ayodhya without any further delay, Ramji Das of Nirmohi Akhara told VHP's Dharam Sabha on Sunday that dates for the same will be announced early next year during Kumbh in Prayagraj. Addressing the Sabha after the inauguration marked by chanting of mantras at the Badey Bhaktmaal ki Bagia, Ramji Das said, "The date for construction of the Ram temple will be declared in the 2019 Kumbh which will be held in Prayagraj. It is only a matter of few days, and I request you all to show some patience," the seer remarked. The Dharam Sabha, the biggest congregation of Ram bhakts in the temple town convened to discuss the way forward for temple construction, witnessed seer after seer stressing the need for construction of the temple at the earliest. Nritya Gopaldas, President of the Ram Janmbhoomi Nyas, in his address said: "Such a large attendance shows that how much people from different walks of life are attached to the Ram temple. "We respect the courts. We have great hopes from Prime Minister Narendra Modi and UP Chief Minister Yogi Adityanath. I request Adityanath to pave the way for construction of Ram temple", he said making a call to the government to do the needful in this regard at the earliest. 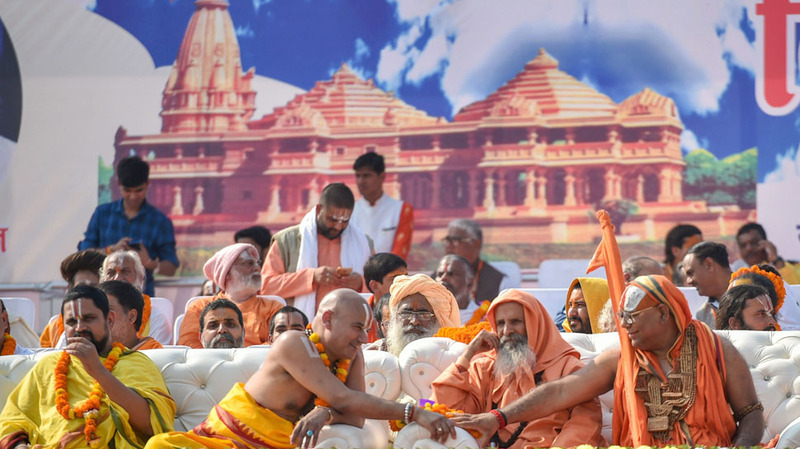 The Dharam sabha venue, which witnessed saffron hue all the way with flags, banners, buntings and head gear in the same colour, also saw the Ram Bhakts taking a pledge for construction of Ram temple, vowing by taking the soil of Ayodhya in their hands. Religious leader Ram Bhadracharya said: "On November 23, I had called a senior union minister who assured that after the model code of conduct comes to an end on December 11, the PM is likely to sit with them and take such a decision so that Ram temple could be built." "We were also told we will not be cheated and I feel that ordinance route may be opted in the winter session of Parliament. We should exercise patience... We have been saddened by the court (nyayalaya se niraash ho chuke hai). The court of people will not deceive us" he stressed. Once Ram temple is built it will become a "ghoshit Hindu raashtra", he told the gathering. Earlier senior leader Champat Rai declared that no formula dividing the disputed land will be acceptable for temple construction. "We want the entire land for temple construction ... No formula dividing the land is acceptable." Though Rai did not spell out the details, his assertions are considered to be in reference to the Allahabad High court verdict dividing the land into three parts.